The 4Q 2018 PitchBook-NVCA Venture Monitor reviews the final quarter of a year in which annual venture capital invested surpassed $100 billion for the first time since the dot-com era. The staggering $130.9 billion invested across 8,948 deals recorded in 2018 was fueled by a rise in late-stage mega-deals ($100 million+), which skyrocketed from last year’s totals capturing $61.1 billion across just 198 transactions. 2018 delivered a 33.0% YoY increase in exit value with more than $120 billion exited, and the year will likely return lofty distributions to limited partners. Last year also recorded the highest figure for fundraising thus far, with $55.5 billion raised across 256 funds. Despite investors’ concerns of a market downturn, these statistics suggest VCs will have capital to fund innovation for years to come. 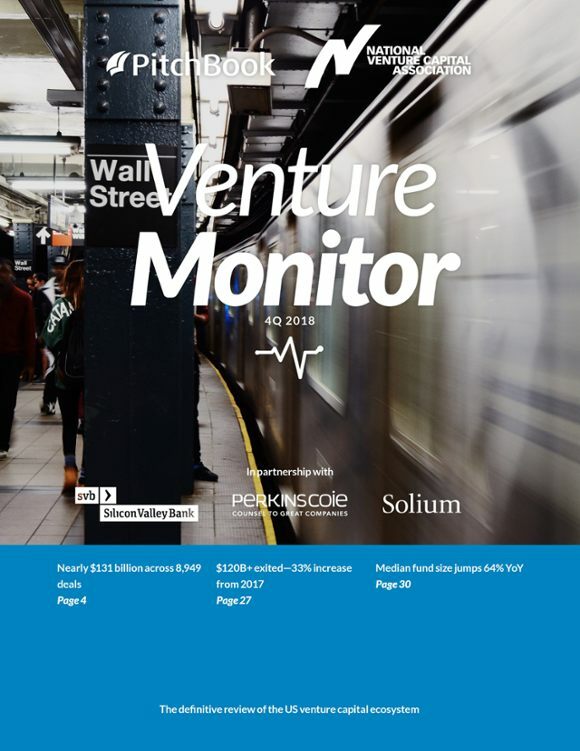 This edition, sponsored by Silicon Valley Bank, Perkins Coie, and Solium, features a Q&A with SVB’s CEO and recaps results from Solium’s 2018 VC executive compensation survey.